Continuous running, constant volume dMEV unit with switched live (LS) and innovative digital display. Quiet running and with high pressure development, the Response is best in class. 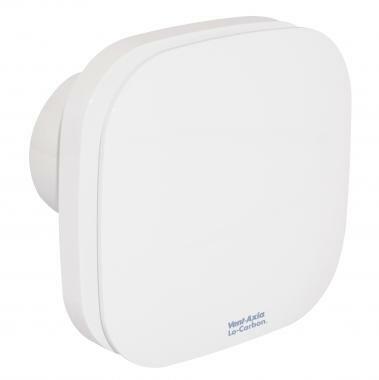 Following the introduction of the new Domestic Ventilation Compliance Guide within Part F 2010, and the requirement to test the installed airflow of extract fans, the new Response fan from Vent-Axia provides the easiest install available. The unique display (patent pending) provides the calibrated installed airflow and pressure of the installation meaning that there is no need to test the installation with an airflow measuring device. The constant volume technology automatically adjusts the speed of the fan to ensure the desired airflow is delivered. With the new silent higher pressure axial impellor this can meet the requirements of many domestic installations without the need to use a centrifugal fan. Using the new high pressure silent axial impeller has enabled the fan to not only develop great installed performance over duct runs, but to do it in the most energy efficient way. Response can provide excellent pressure whilst still maintaining the energy efficiency and not wasting energy on high pressure at low air volumes. Existing centrifugal fans often develop pressure but the actual installed airflows can mean that the pressure is of no use as the airflow falls below the requirement. This enables the fan to save up to 64% of the specific fan power (SFP) of the SAP Appendix Q data for existing centrifugal alternatives. Designed to offer a more relaxing environment to the homeowner, the Lo-Carbon Response features a delayed start option. This new, patent pending comfort control option is selectable at installation and allows the homeowner to enjoy a quiet, peaceful bathroom for up to 20 minutes before the Boost activates. Furthermore, if the light switch turns On and Off within 3 minutes, the Boost will not activate. No more disturbing the family if the bathroom light is turned on during the night. Auto speed selection at installation. The integral air pressure sensor checks the airflow when first installed and also helps the fan to compensate for external wind pressure. For kitchen, utility and bathroom/toilet applications, the continuous running TP model incorporates an adjustable overrun timer. This adjusts the time the fan will continue to run on boost after the LS connection has been deactivated. This is also the run time period for the pullcord. For kitchen, utility and bathroom/toilet applications, the continuous running HTP model incorporates an adjustable (40% - 90%) ambient response humidistat. The fan will increase the extract rate if the humidity rises above the point set at installation. Datalogger as standard. 100mm Wall Fitting Kits (White) For installing into most walls using the telescopic liners supplied.